Sunday March 24 1907 I did up the regular work and baked a cake to take down home for dinner as it was Father's [91st?] birth-day. We had a very pleasant day together. Father feels much better. Will came home before I came at 4.20. Did evening work and went to bed early. The day was warm and I felt very tired. Mary Woolf here jist before supper for two hens to set. Monday March 25 1907 I was busy all forenoon with house-work. I had extra work with the milk. Will and I to town together in the buggy in afternoon. Went out to John Craigs of an errand. I got my napkins today that I ordered that Mother gave me. I paid for the milk separator and and went to Dr Smiths to take treatment. Weather warm. Will sold 11 hogs this morning at $6.00 a hundred brought 162.00. I got $40.00 of it. 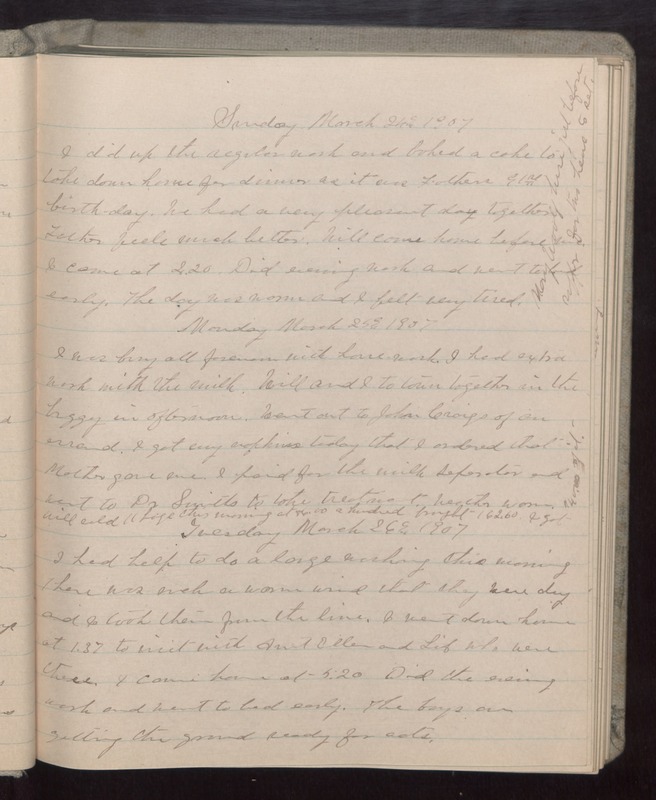 Tuesday March 26 1907 I had help to do a large washing this morning There was such a warm wind that they were dry and I took them from the line. I went down home at 1.37 to visit with Aunt Ellen and Lib who were there. I came home at 5.20. Did the evening work and went to bed early. The boys are getting the ground ready for [oats? ].